New Year means new expectations, and anticipation for all the favourite things of the year to happen all over again. But in Australia, the excitement is several times more because New Year means another series of sports events that Australians love and admire. Then again, it is hard to contain your excitement when high-profile events of football, rugby, motor race and the horserace are on the line. Talking about horseracing, we must prepare ourselves for the biggest Australian horse racing event in the world; The Melbourne Cup. While it is the best in the world, it is almost an occasion in Australia, and event that halts an entire nation in its tracks or as Aussies like to say, “the race that stops a nation”. The winners of this prestigious cup do not only get the bragging rights but also some extraordinary prizes for their win. And naturally, when the reward is high, the stakes are high, which makes the race all the more entertaining for the spectators–albeit not for the losing party. Last year, the winner was awarded $6,200,000, not to mention the one-of-the-kind cup that varies in design each year. The last one was made of 44 pieces of gold metal which were hand-beaten for 200 hours. Being one of the biggest horseracing events, the horses that race on the tracks of the Melbourne Cup are only the greatest and well-reputed. The fact that the most serious contenders are competing against each other creates hype and an anticipation to know which one will come out triumphant on the finish line. The most watched Australian horse racing event with the most competent thoroughbred horses allows a huge number of betters to put their money on the line. In fact, in 2000, it was discovered that 80% of the population of Australian adults placed bets on the race. 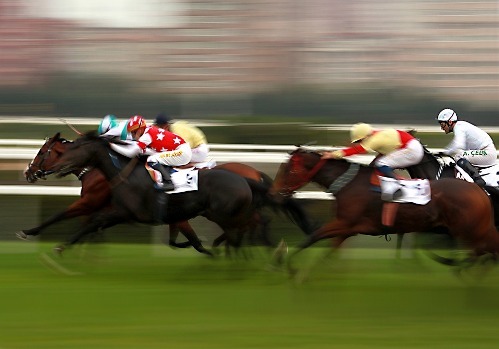 Melbourne Cup’s betting turnover is so high that the price goes as high as billions of dollars. The horses are beautiful, the crowd is beautiful but what is even more of an appealing factor of the race is the famous Flemington Racecourse. This racecourse is surrounded with roses and immaculate grounds, with the crowd donning hats, drinking champagne and wearing the trending styles. All this makes it the most happening event in the world. This race is so special that the home state of the race, Victoria, gets a public holiday just for the occasion while the rest of Australia does nothing but watch the event without blinking an eye. To earn a Melbourne Cup even once is challenging as the horses race side-by-side, giving each other a hard time. But when, once in a while, a mighty mare like Makybe Diva makes groundbreaking records, it attains a reputation. So now you see why the Melbourne Cup is dubbed as the race that stops a nation? When so many horseracing enthusiasts are found in a nation, it creates exemplary events like these.